STEP 1: Apply a base coat to protect your nails. STEP 3: When the white polish has dried up, Use a dotting tool for the cherries – If you don’t have one… earbuds work well too! STEP 4: Use a really thin paint brush to draw the leaves and stems. 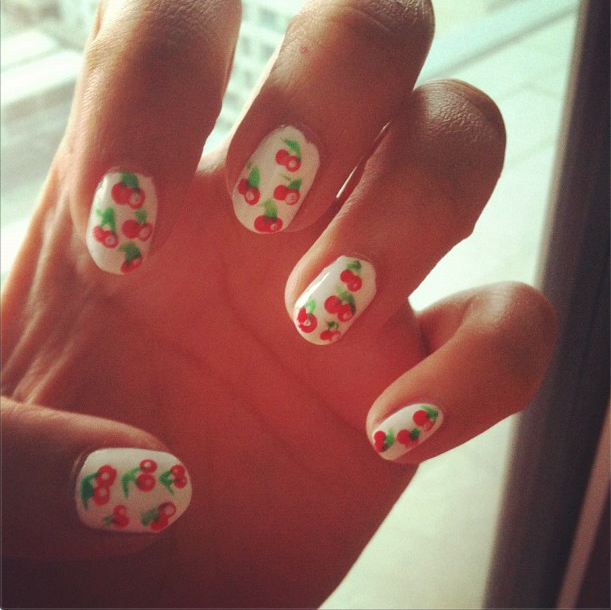 STEP 5: Add a white dot on the cherries to highlight them which is not necessary but it does look really cute! STEP 6: To finish up, Add a base coat for shine! If you would like to share them, post a picture on Rock&runway’s Facebook page.I would love to see how they turned out! I simply want to tell you that I’m all new to weblog and really savored you’re web blog. More than likely I’m going to bookmark your site . You actually come with tremendous articles. With thanks for sharing with us your blog. Hi Fine wewebsite. Achieve you want to guest publish in my own someday? If that’s the case delight consent to me know by resources of e-mail before immediately come back with this kindly of observe ever since I enrolled in notices and definately will recognize should you. You ought to be a part of a contest for one of the most useful websites on the net. I most certainly will highly recommend this blog!